Way back in the middle of winter, Urban Initiatives’ team set their minds on the end of May, where warmer weather would bring everyone’s favorite event of the year, the Second Annual Work to Play Cup. The event was a huge success, and it could not have been possible without the support of all the sponsors, volunteers, coaches, families and of course, the kids. With the early arrival of eager volunteers, Midway Plaisance was buzzing as the impending arrival of hundreds of Work to Play program participants drew near. Disc cones, Nike soccer balls, sidewalk chalk and tug of war ropes were laid out, creating the ultimate playground for first to eighth graders from 29 Chicago Public Schools. As the first bus arrived, a collective cheer arose from the 170 volunteers who had gathered on the Midway’s skating rink. Soon thereafter, a long line of buses, each full of excited kids who couldn’t wait to play, turned onto the Midway . Kids, coaches and family members exited their busses, laughing and high-fiving as they walked to their first stations of the day. Just moments after arrival, Midway Plaisance was flooded with a sea of blue, red, orange and green Nike jerseys. The morning kicked off with kids rotating between Work to Play soccer stations and Play with Potential recess stations. After working up an appetite on the field, each Urban Initiatives kid enjoyed a healthy and delicious boxed lunch donated by our friends at Aramark. After four hours of playing, it was time to celebrate all of the hard work and commitment each Work to Play soccer player displayed throughout the school year. Hundreds of kids, coaches and families walked over to the Midway Plaisance ice rink where some very special guests awaited their arrival. NBC 5 Meteorologist Alicia Roman welcomed and congratulated all of the kids as 25 different Chicago communities stood together as one team. Alicia Roman then introduced Co-Founder and Executive Director Jim Dower as he presented Mike Kelly, C.E.O. of the Chicago Park District, with this year’s Most Valuable Partner (M.V.P.) award. Mr. Kelly and the Chicago Park District have been such great supporters of Urban Initiatives over the years, and there was no better time and location to recognize them than in front of hundreds of cheering Work to Play kids who truly appreciate all of their support. Next, it was time to honor the rock stars of the day, the kids. 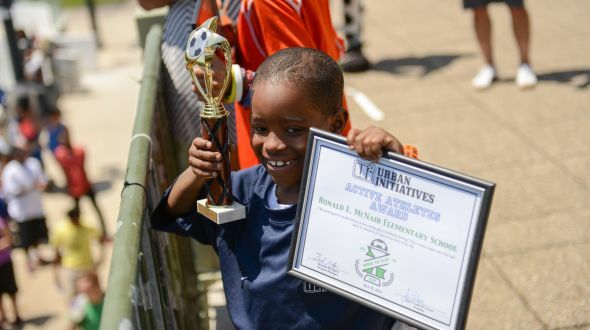 Each school received an award, and with honors ranging from “Grittiest Team” to “Healthiest Team”, each Work to Play school walked away with an award they can surely be proud of. After the awards were presented, the whole crowd – every kid, coach and volunteer – squeezed in tight for a group picture that showed the impact of Urban Initiatives. Moments later DJ Freddy Phatz dropped the beat and the dance party began. On Site Program Directors passed out certificates and medals, and parents joined their kids and posed for tons of photos. As the day then came to an end, school busses began to fill up and kids with medals around their necks and smiles on their faces began to fall asleep on the ride back to school. The Second Annual Work to Play Cup would not have been possible without the support of all our sponsors and volunteers. A special thank you to Mike Kelly, Mr. Rick, Mr. Geno and the Chicago Park District for all of their support. Last but certainly not least, Urban Initiatives thanks all of the On Sight Program Directors, Assistant Coaches, principals, teachers and families. Without you the Work to Play Cup and Program could not be a success. We thank you all! Urban Initiatives wishes all of our kids a happy and healthy summer! You can find PHOTOS HERE and HERE. Previous Article: The Cubs Can’t Wait for Summer Camp!